I know nothing about art. If you tell me a painting is famous, I'm likely to believe you because I have no knowledge whatsoever about art. But in the past two months, I've been lucky enough to see some of the most famous works of art still in existence. I thought I'd document it here...and perhaps do a little research about these paintings as I write. In Florence, our art adventure began at the Accademia. As far as I can tell, the only real reason you go to the Accademia is to see David. It was a relatively small collection of other works, but David alone makes it worth the visit. David was moved to the Accademia in 1873 to protect it, as it was originally intended to be outdoors. A replica stands in its place now in the outdoor location. Along with the Pieta at the Vatican, it is this sculpture that gave Michelangelo the reputation as the "foremost sculptor" of his day. Along the corridor leading to David, are five other Michelangelo sculptures, including the four unfinished "Prisoners". While in Florence we also visited the Uffizi Gallery. I was so thankful for Rick Steves' audio guide while in the Uffizi. Otherwise, I wouldn't have known what I was looking at or why it was important and it also took a large art museum and helped you focus on some of the "famous" paintings. I remember the Botticelli room best. These two paintings are of his most famous. Understanding a painting is like reading a complicated book- you have to look for the meaning of things below the surface, or in my case, read about it on Wikipedia. There are, of course, varying interpretations of these paintings, but, in general, it seems that "Primavera" is related to the fertility of the world, featuring the goddess of Spring, known as none other than Primavera. As for the "Birth of Venus" most state that it was painted to inspire both physical and intellectual love. It was painted in 1486 and shows Venus emerging from the sea as a full-grown woman. Or, so says Wikipedia! Just looking at the pictures online does nothing for these works of art, but I remember sitting in the Botticelli room at Uffizi and thinking that, in person, there was something quite spectacular about them. 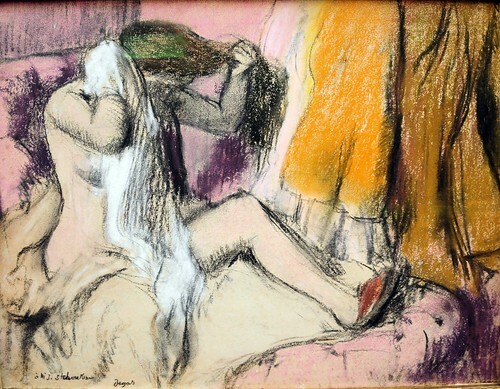 It took until my recent trip to Munich before I went to another art museum. Kate and I went to both the Neue Pinakothek and the Pinakothek Moderne. The modern art museum left a lot to be desired in my mind. As Kate said, "Don't just hang a light and expect me to believe it's art!" Seems like a theme in the modern art museum. There were many rooms that left me a little perplexed as to why it was deserving of so much space in a well regarded museum. But, to each his own, I suppose. The good news was that the Neue Pinakothek was rather amazing. After three trips or so to the lockers to successfully put away all the materials not allowed in the gallery, we wandered through the rooms. I had zero idea of what art was in this collection, but found myself among some paintings that everyone has heard about before. One of Claude Monet's 25 "Waterlilies" paintings-- this one was painted in 1915. Van Gogh's Sunflower series...this one, painted in 1888, has the blue background, and was the 3rd in the series. The first in the series has a turquoise background with less flowers and is part of a private collection. The second painting had a royal blue background, but was destroyed in a fire in Japan during World War II. The fourth painting has a yellow background and can be seen at the National Gallery in London. Both the third and fourth versions were repeated by Van Gogh in different forms in later years and can be seen in other galleries. 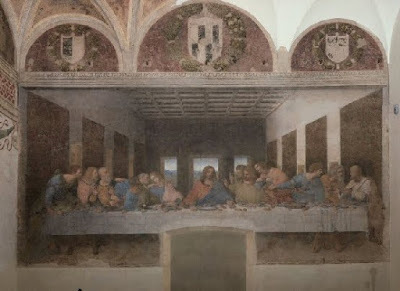 Most recently, the Melrose Place crew (Kate, Simon, Tegan and I) went to a church in Milan (Santa Maria delle Grazie) and spent 15 minutes in front of Leonardo da Vinci's "The Last Supper". Only 20 or 25 people are allowed in every 15 minutes, so getting tickets must be done in advance. In fact, we bought our tickets for December 15th in the middle of September. Craziness! But, the experience was really nice. It is not too crowded, no one is pushing in front of you to take pictures and the painting is well lit. The biggest disappointment about the painting is the huge door that the monks cut in the painting back in the day when the building served as a stable. So, Jesus' feet are no more...while there is not a door, they've painted one in its place. Hmph. Found this picture on a blog...looks like they found a way to take a picture!